An attempt has been made to discredit and eliminate the Inspector General of Police (IGP), Nana Owusu Nsiah and his two deputies to satisfy the whims of some few disgruntled senior officers of the Ghana Police Service. Some officers of the Service for the past few months all alleged to have conspired with one Israel Doh, a civilian employee of the service to use “Juju” to eliminate the IGP. Mr. Doha in carrying out the plot of ending the life of the IGP was aid to have removed the air-condition (AC) in the IGP office, passed it through a hole carved out of the IGP's window and sprinkled some herbal concoctions at every corner of the office most importantly on his chair. He run out of luck when he was arrested by the vigilant guards of the IGP and later dismissed form the service after investigations were conducted. The men satisfied that their plot had backfired adopted a new strategy to demoralize and paint the IGP's personality and reputation black by accusing the IGP and his deputies of nepotism and massive mismanagement and misuse of resources. They alleged that promotions and appointments, UN peacekeeping selection, welfare scheme, fuel allocations, procurement and supplies of accoutrements and equipments and projects are fraught with illegalities among others. 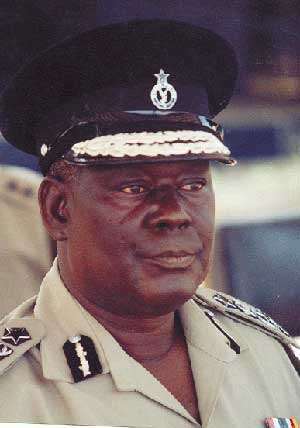 The IGP was out of town when contacted last Thursday but the Public Relations Director of the service, Chief Superintendent Ampah Bennin denied all allegations leveled against the IGP and wondered how some senior officers would plan such a thing against the top hierarchy of the Service.